Data, cloud and powerful networks will drive a significant improvement in care, the former Alphabet chairman said. 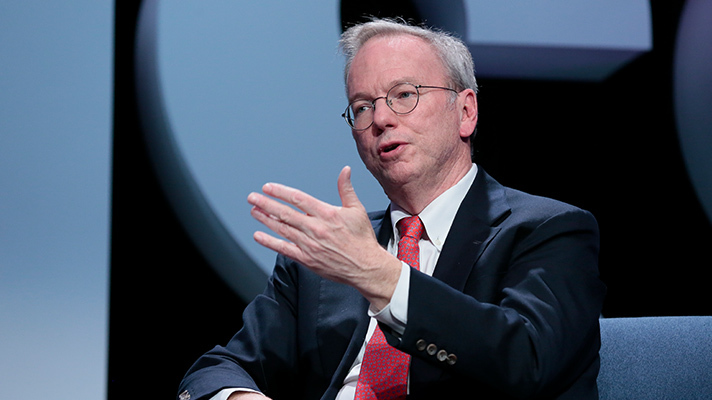 LAS VEGAS -- Eric Schmidt delivered a hearty dose of optimism Monday evening in the HIMSS18 opening keynote. “A revolution has been happening in my industry. Scale changes the rules, scale changes everything,” said Schmidt, who is the former Executive Chairman of Alphabet and today serves as a Technical Advisor to Google’s parent company. “The combination of cloud, deep neural networks, the explosion of data will give you a model." HIMSS CEO Hal Wolf said that healthcare is at a critical moment. Organizations in countries around the world are facing the same challenges of too little funding against the oncoming Silver Tsunami bringing new aspects of disease burden and savvy consumers who turn to Dr. Google when hospitals cannot deliver what they need. “We’ve come to the point where we’re building upon investments in IT to use the massive amount of data that comes out every day and transforming that data into information and knowledge,” Wolf said. Schmidt pointed as example to a theoretical technology product he called Dr. Liz — named in honor of the first woman to earn a medical degree, Elizabeth Blackwell — a scenario wherein a voice assistant in patient rooms interacts with consumers, makes evidence-based recommendations to doctors and handles all the administrative burden of working in an EHR. That’s not to say it will be here tomorrow, but Schmidt laid down a clear path toward just such an innovation akin to email, the Internet or smartphones that will be the proverbial killer app that causes all sorts of interactions and connections. Here’s what Schmidt said that will take: A clinical data warehouse packed with diverse data sets that are curated and normalized such that sophisticated analytics can be run against the data and accessed with a rich API. Hospitals then need a second tier of data to supplement EHRs. The only way to achieve that is by adopting the principles of cloud computing and doing so quickly because the cloud is safer, more HIPAA compliant and easier to use, Schmidt said, adding that of course, he wants hospitals to use Google’s cloud but urged that picking a competitors' cloud services is better for everyone than not using any at all. Reinforcement learning requires those powerful networks. Schmidt described the concept of consisting of a simulator, training data, real-time experience to that looks at forwarding outcomes. “We believe we can build reinforcement solutions to significantly improve pathways of care,” Schmidt said. HIMSS CEO Wolf noted that these challenges are not just about information that comes from within healthcare institutions, but also data that comes from the outside. Schmidt last spoke at HIMSS in 2008 and in 2018 he promised if he’s invited back in 2028 he will bring the equivalent of Dr. Liz.